Vermont, Maine, and New York; according to our final list of the top 50 North American ski resorts (which was carefully compiled with input from you, the reader), these are the East Coast states with the most sought after slopes. 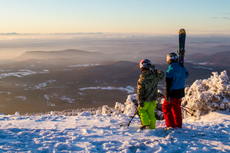 Dominating more than half of the East’s top 10 (and easily filling in the list’s top 3, too), Vermont has no doubt claimed its crown as king of skiing on the Atlantic Coast. Of course, ski devotees across the 50 states know this comes as not much of a surprise. With quality classics like Stowe, Killington and Jay Peak it’s almost certain that the Green Mountain State will forever be known as one of the continent’s most superior skiing sanctuaries. That’s not to dismiss a few popular destinations in New York or Maine, though. Our top 50 list proved there’s great skiing to be discovered in these states, too. The best part, each resort offers a unique experience, which means no matter what type of skier you are, one or another is bound to please your high standards for powder.